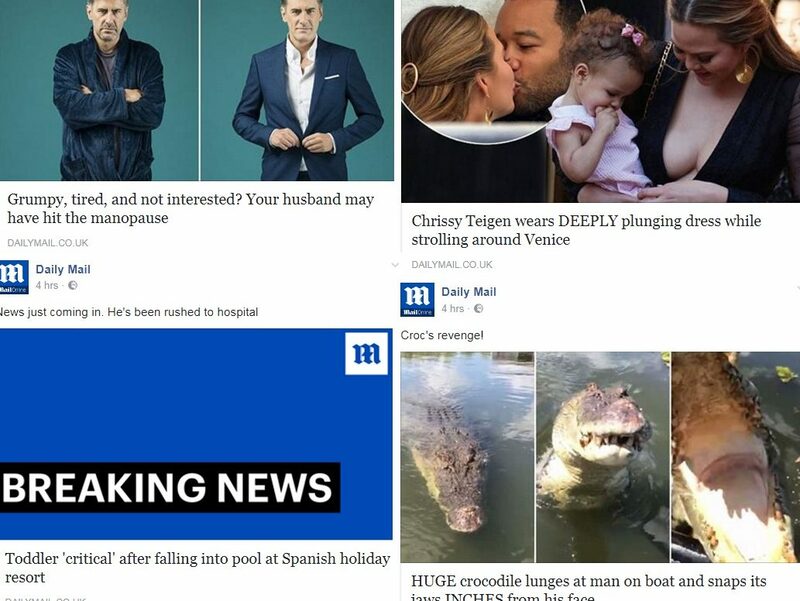 Mail Online has topped the list of the most engaged websites on Facebook for July, claiming the most total likes, shares, comments and reactions over the month, according to new analysis by Newswhip. 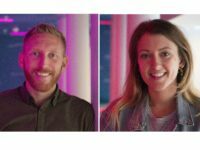 The firm, which analyses social media content to predict viral stories, said Mail Online recorded over 26m “interactions” on nearly 51,000 posts in July. 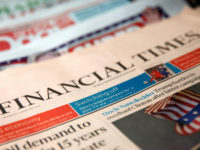 It is the first time Mail Online has topped the list, which comprises English-language digital publishers around the world and does not include reader engagement with native advertising content. 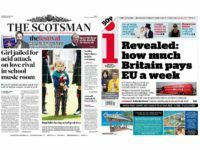 The only other UK-based website in the top ten, as ranked by Newswhip, was the BBC, which placed ninth at more than 17m interactions. The majority of publications are US-based, with entertainment news website Bored Panda coming second and Huffpost third. 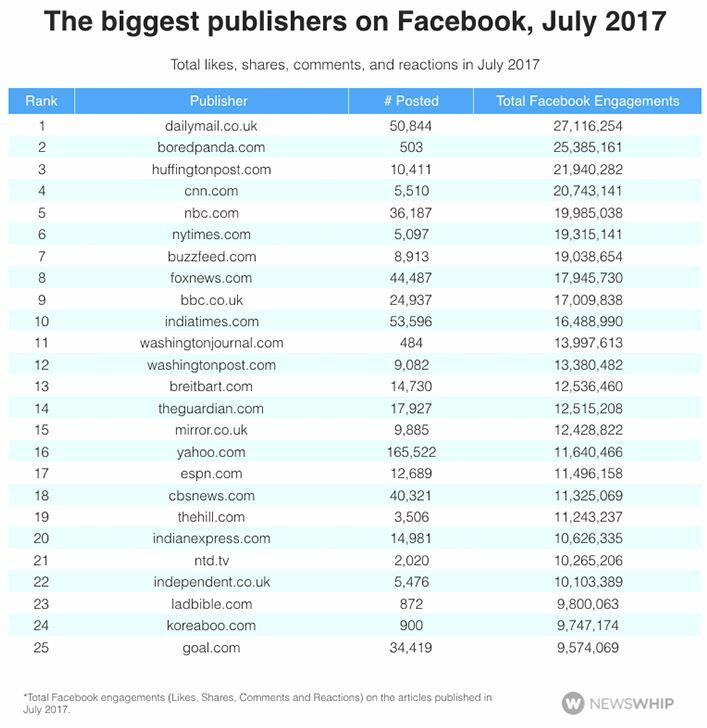 Expanding out to the top 25 “biggest sites” on Facebook for July, a total of seven publishers are UK-based, according to Newswhip data. The new figures show Mail Online is up by 4m interactions since March, when the last Newswhip survey was carried out. 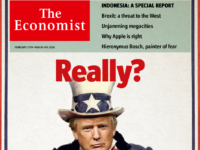 A Newswhip spokesperson said: “It’s probable that the Mail’s focus on the US market has much to do with this extended reach.  “In terms of what’s working for the Mail on Facebook, the site is well-known for its descriptive headlines, which can be seen both on their website and social pages. 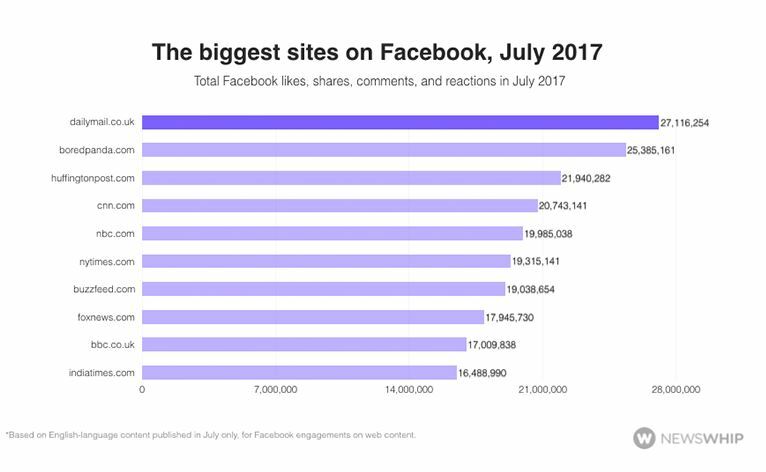 “Most of their most popular stories on Facebook in July also focused on breaking news stories and human interest angles. 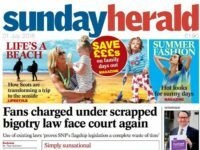 Mail Online publishes stories from the Daily Mail newspaper as well as its own original content, although a leader in the Daily Mail in June said the website is a “totally separate entity” from the paper. Mail Online has more than 15.4m daily unique browsers on average, according to ABC figures for June. The Independent places at 22 on the Newswhip Facebook rankings for July. 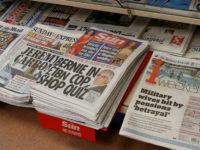 The website claimed the largest number of viral news stories relating to the UK general election during the campaign run, according to Buzzsumo analysis. To everyone who desires to join the Illuminati organization, it’s totally free, anyone asking you to pay any money is a fraudsters. Be careful with such people! Don’t lose your hard earned money to fraudsters especially this period, a lot of desperate people are out there looking for ways to survive. Just tread with caution, money is hard to get! to join the Illuminati, kindly call or WhatsApp me with this number +2348180828544 You will receive a confirmation Message from the Illuminati confirming your registration. once that is done, you will be receiving Message ge from the Illuminati, kindly read the messages and be Patient! Don’t be in too much haste! this is one reason why some of you keep being scammed, because you’re in a haste to getting there. Patient is a virtue, be patient!